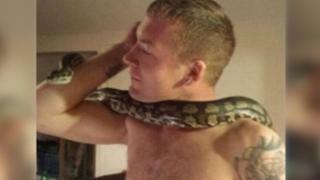 A snake owner was killed by an 8ft (2.4m) pet python he called his "baby", an inquest has heard. Daniel Brandon, 31, died from asphyxiation at his home near Basingstoke, Hampshire, on 25 August. One of the pets - a female African rock python named Tiny - was found near his body, out of its pen. Coroner Andrew Bradley said there was no doubt Mr Brandon died "as a result of contact with Tiny" and he recorded a verdict of misadventure. Mr Brandon had kept snakes for 16 years and Tiny was one of 10 snakes and 12 tarantulas he kept in his room at the family home, North Hampshire Coroner's Court heard. His mother Barbara Brandon said her son had owned Tiny since it was small enough to fit in his hand. He never felt threatened by Tiny and was aware of how strong it was, she said, but there were occasions when it would "strike out" if she entered the room. She told the court on the night of her son's death she heard a bang coming from his room, but had assumed it was a dumbbell falling or that he knocked something over. She later discovered Mr Brandon unconscious in his bedroom and later found the snake coiled under a cabinet. Pythons kill by wrapping themselves around their prey and squeezing tighter and tighter but they rarely kill humans. Mr Bradley said: "The most likely scenario is that Tiny was engaged with Dan - I have no doubt about that. "She was coiling around him, at which point I have no idea. There was a point at which either she takes hold of him unexpectedly or trips him up or some other mechanism." Mr Bradley said the snake then hid, probably "because of the shock of him falling or because of his reaction". However, reptile expert Prof John Cooper, who examined Tiny at the Brandons' home in November, told the court Mr Brandon "would have known how to unwrap a python". Prof Cooper also inspected the skin that Tiny shed later that month and said if the snake had coiled around Mr Brandon, there would have been scratches visible on the snake's skin caused by him trying to get the reptile off - but there were none. A statement issued by Mrs Brandon after the conclusion of the inquest described her son as "one of the funniest people you could wish to meet". "I cry every day and night and relive that evening all the time," she said. "All the family wanted was answers to our questions, and I have no idea yet whether we have that or will." Mr Brandon's social media pages showed him posing with snakes, including a Burmese python. Friends set up a JustGiving page to raise money for the World Wide Fund for Nature (WWF) and the Royal Society for the Protection of Birds in his memory. A friend posted: "Dan was obsessed with snakes, spiders, birds and all wildlife. "We have struggled when looking for photos for his funeral to find any when he isn't holding a spider, snake, small bird, toad, slow worm, hedgehog, feeding a fox, stroking cattle, befriending a cat or dog so these charities seemed the perfect choice."